Over here in Ontario, Mr. Groundhog announced that Spring will come early this year. I don't know much about this groundhog. He could be a total fraud or a drunk. Maybe he's a compulsive fist-pumper who watches far too many re-runs of Jersey Shore. Perhaps he smuggles Iberico ham in from Spain and pawns it off for acorns and pine cones. Who knows! He could be a complete nut job! But, when someone or some animal says that there will be 6 weeks less of winter...that is, six weeks less of smelly boots and excessive lotion application, and roughly 42 days closer to Summer...you listen! I'll take it. I don't know if it's true or not but heck, at least a girl can dream. Bring on asparagus, rhubarb and strawberries. I'm so ready. To warm up these cold months, I've decided to make something super summery. I'm a big freezer of fresh berries, especially blueberries. To do this, first get them when they're at their peak in the summertime. Wash and dry them and then simply lay them flat on a baking sheet. Place the baking tray in the freezer until the berries are rock hard. This is called Individual Flash Freezing and lets cold air get all around each berry so that they freeze faster for better quality and less cell damage. Once frozen, pile them into a resealable plastic bag. I like to wrap them twice. They hold up so well for months and help me to remember how good the sun feels beating down on my face in the middle of August. It takes me to a happy place of warmth and green grass. Can we go there for a little while? Let's go there. 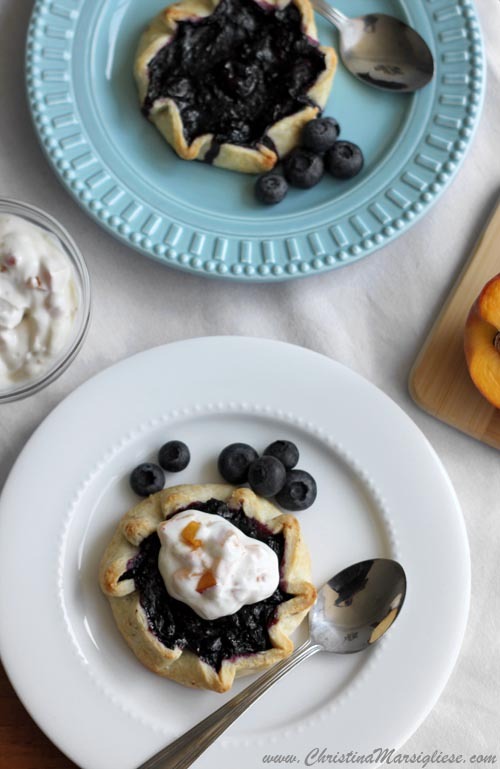 These little single-serving Blueberry Tartlets with Peachy Sour Cream are a reminder that Summertime still exists. I tried to pack as many blueberries into the filling as I possible could by stewing them down with some lemon juice. Then you stir in a slurry of cornstarch to thicken it considerably so that you can easily spoon it onto flat rounds of pastry without it spreading all over the place. It's physics happening in the kitchen. They are sized perfectly for one and they're super simple to make because they don't require any sort of pie or tart pan. They're free-form! Rustic. Casual. But entirely wow-worthy. The crust is made with butter and a bit of cornmeal to give it an unexpected crunch and rich flavour. Bonkers. Now can we get to the peachy sour cream topping? Oh good gracious. It's so perfect. Finding good peaches or nectarines in winter is nearly impossible, I get that. And I usually don't buy peaches way out of season like this. But, I'm trying to make it feel like Summer when it's cloudy and nipply outside, so bear with me. This can be fixed with a bit of sugar. With these guys around, Winter doesn't stand a chance. You are totally winning this battle. To make the crust, first place the butter in the freezer for 15 minutes. In a large bowl, whisk together flour, cornmeal, sugar and salt. Add the cold butter and rub it into the flour mixture using your fingertips until it resembles coarse crumbs. The fat should be well dispersed but there should still be some larger pieces the size of oat flakes. Place the bowl in the freezer for 5-10 minutes to allow the fat to firm up again. Slowly drizzle water over flour mixture, one tablespoon at a time, while gently stirring with a fork until the flour is moistened and it holds together in clumps. You may not need all of the liquid. The dough will hold together when squeezed or pressed when it is ready, but it should not form a ball. Turn dough out onto a clean surface and bring it together with your hands, pressing in loose bits. Flatten it into a disk, wrap in plastic wrap and refrigerate at least 2 hours or overnight. To make the filling, combine 2 cups of blueberries and sugar in a 3 or 4-quart saucepot over medium-low heat and cook, stirring often, until the berries begin to burst, release most of their juices and start to simmer, about 10 minutes. The mixture will look soupy. In a small bowl, add corn starch and slowly whisk in lemon juice and water until well blended. Stir this mixture into the pot with the blueberries off the heat. Return the pot to medium heat and bring to a gentle boil, stirring constantly. Once boiling, continue to cook for another 2-3 minutes until thickened. Stir in remaining 1 cup of blueberries and transfer mixture to a bowl. Cover with plastic wrap directly on the surface and refrigerate until completely cooled. Preheat your oven to 400°F. Line a large baking sheet with parchment paper. On a lightly floured work surface, roll the dough to 1/8-inch thickness and cut out 5-inch rounds. Place a couple of tablespoons of filling in the center, leaving about 1-inch border. Fold and crimp the edges of the dough over the filling, sealing tightly. Transfer tarts to a baking sheet and freeze for 5 minutes. Lightly brush cream evenly over the pastry. Sprinkle with sugar and scatter little dots of butter over the filling. Place on bottom rack of oven and bake for 10 minutes. Reduce oven temperature to 350°F and bake until crust is golden brown and juices have been bubbling for at least 5 minutes, about 20 minutes longer. Transfer tarts to a wire rack to cool slightly before serving. 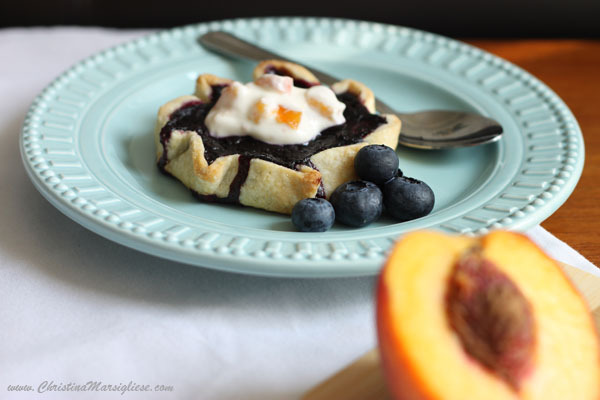 To make the topping, stir together sour cream, sugar and peaches and serve over each tart! Oh goodness these look delicious! I do the same thing with stocking up on blueberries for the winter, but I never knew the individual flash freezing technique. I'll be sure to do this next summer. For now, I still have a bag full of blueberries that need using up, so I'm saving this recipe just for them. Thanks Maggie! You'll notice a big difference in quality when you IFF your berries. They'll be perfection. Oh my gosh!! Look at these beauties!! I love that they're individual tarts too! What a gorgeous little treat :) Lovely how simple yet sophisticated this is! Wow these are beautiful! I love that peachy sour cream too. YUM! My your tarts look so appealing. And I love their summer finest aquamarine plate!! Just lovely. Even the peachy sour cream sounds delicious and I do not care for sour cream! It's one of my favourite plates! Stopped by to say hello and rerad your latest. I'm a friend from FoodBuzz. Wow! 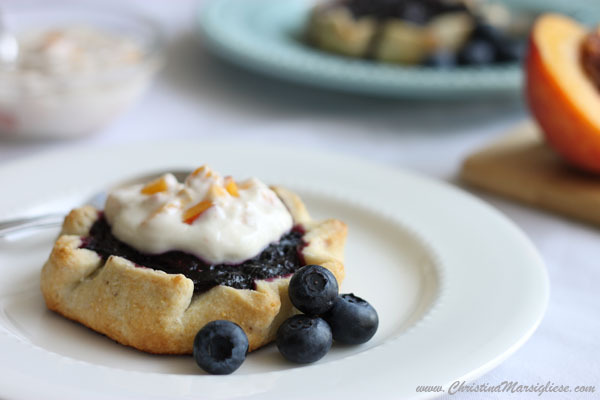 These tarts look absolutely DELICIOUS! Great presentation. I only wish they were on a plate here next to my cup of coffee. I wish I could beam one to you. These tartlets are absolutely beautiful!